Elon Musk, the billionaire founder of Tesla and Space X, is widely recognised as visionary. Tesla started as a company with an idea beyond its time in 2003. Many criticised the work of its famous and current CEO Elon Musk at the time for thinking outside the box. The last fifteen years have seen Musk and Tesla growing far beyond anyone’s imagination. From electric cars to a dummy payload in the space, the market and the media has time and time again been stunned by the work. And Elon’s bold statements. Musk recently said that a $25,000 fully electric car could be possible in around three years. With all the positives and negatives, Tesla has managed to maintain its position in the eyes of investors. The electric car company’s shares soared 11% to $379 after Musk’s so-called “Tesla tweet” (7th August) that he had “funding secured” to buy out investors at $420 share. But that tweet – now the subject of legal action and a regulatory inquiry – so far has not led to an offer and Tesla’s stock has fallen 19% to $308 per share. Many journals reported that the privatisation was done in order to protect the company from the short sellers. By 20th August, stock price fell below $290 per share as many investors and analysts doubt this proposal. 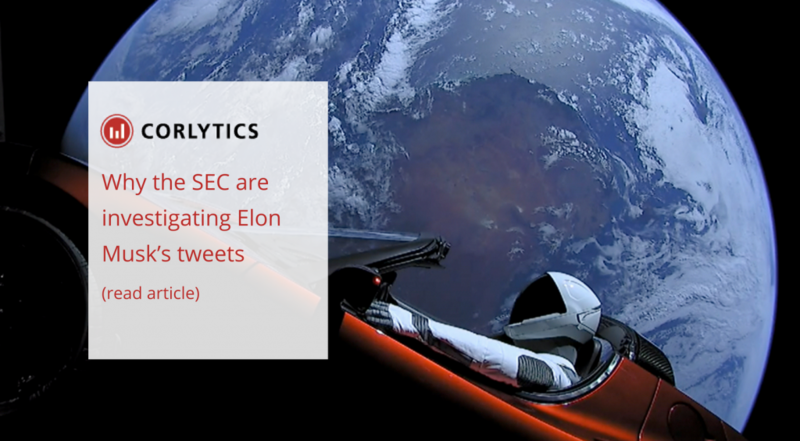 Elon Musk’s social media presence affected more than just the company’s stocks; it led to the Securities and Exchange Commission (SEC), the financial market regulator in the US, launching an investigation for material misrepresentation. The SEC was concerned about the authenticity of the proposal, as the news was published on the social media platform Twitter rather than as a regulatory filing. The main focus is on Musk’s affirmation that the electric car maker had “secured funding” for the privatisation. Market speculations are common, but such statements can lead to individual penalties for Musk. Many analysts, especially lawyers, who have been closely watching the event unfold believe that Elon Musk may have violated Rule 10b-5 of the securities law. One of the most important and widely used anti-fraud securities rule. This comes as no surprise. Corlytics’ database has captured over 200 cases since 2009 where companies have come under the scrutiny of the SEC for this rule. In June 2017, the SEC fined MRI International and its CEO for Rule 10b-5 and other sections under the Securities Exchange Act. The fine was one of the biggest fines for this rule and together they were charged a hefty amount of $584,359,368 for penalty, disgorgement and prejudgment interest. Furthermore, material misstatements are known to affect the integrity of the financial market. In 2013, the SEC filed a case against Netflix and stated that companies were allowed to make announcements about their workings as long as investors are informed beforehand. The electric car maker, though not in so much limelight, is certainly under attack following its CEO’s bold statements on social media. Opinions in the market are flying around Elon Musk, that even the Financial Times took to comparing the man to a teenage “kidult”. It will be interesting to see what the future of Elon Musk and Tesla holds in terms of investment.